Description: 1962 Seagrave 1000 G.P.M. Quad; The word ’Quad’ used in connection with fire apparatus means that the truck is a quadruple combination pumper. That is, it is capable of performing four different functions: 1. A 1000 G.P.M. Pumping Engine (pumper); 2. Carries its own 500 gal. Water Supply (tanker); 3. Carries its own 1300 ft. of Hose (hose wagon); 4. Carries a full complement of Ladders (ladder truck). This apparatus is in service today at Engine #48 in southwest Detroit. Equipment of this type is needed because this area is often cut off from other companies when boats pass through the Rouge River. 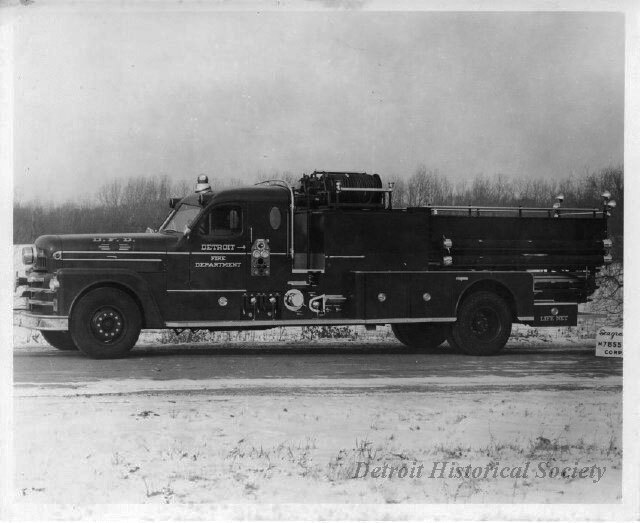 Photo courtesy of Seagrave Corp. Circa 1962.